From the sidelines, I have marveled at the creative successes of my favorite food bloggers for about two years. They have lured and enticed me to try different recipes, rush out to the grocery stores, retail stores and book stores for all of the necessary items. They have had a very powerful hold on me. Never mind the fact of having a very small kitchen located in a barn, I now have more equipment, books, and paraphernalia than any one person should have. My lists of recipes abound. Too bad I have a daytime job, or is it too good? I can't decide if it is a good or bad thing, since most of the time there are only two of us to eat all of this food! Gene (husband) and I enjoy an assortment of foods from other regions and countries. We transport ourselves happily and frequently to these places through their cuisines. 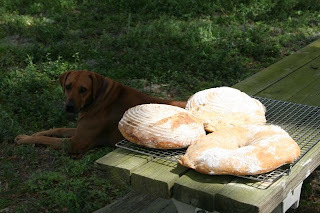 My son-in-law David even built an adobe oven under the shade of an ancient live oak, where we experimented with baking rustic loaves of bread and pizza. 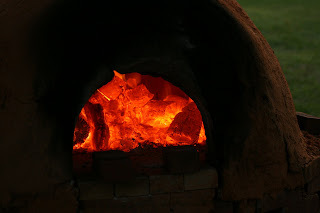 Sadly, the oven has collapsed and needs David's help to restore and improve it. My new year begins with this blog and an attempt to write about the things and foods that roll through my small barn kitchen. Life is good. The bread and pizza were delicious. Hopefully it will be up and working agian.